Another short section between towns, this section of Track is known as a section of transition. For the first time, south-bound walkers will see trees that appear nowhere else in the world. The jarrah, marri and yarri forests soon give way to the majestic karri forest, the second tallest flowering gum in the world. This transition signifies the reaching of the halfway point along the Track - a fabulous milestone for the end-to-end walker. An early morning at the Blackwood campsite, perched high above the Blackwood River, is typically characterised by the rising and falling mist in the valley below, whilst warming rays of sunshine penetrate the pine trees to the east. Walkers encounter the famous cardiac hill as they descend to the Blackwood River. There will always be much discussion around the campfire whether it is easier going up or down! At Gregory Brook campsite, the brook bubbles by as walkers look high up to the flowering banksias in the spring. Following a few more rail formations, walkers soon arrive at the small village at Donnelly River - time to take off the boots, relax on the verandah of the general store and watch the emus and kangaroos try to steal your ice cream! The Golden Valley Tree Park showcases trees from around the world. 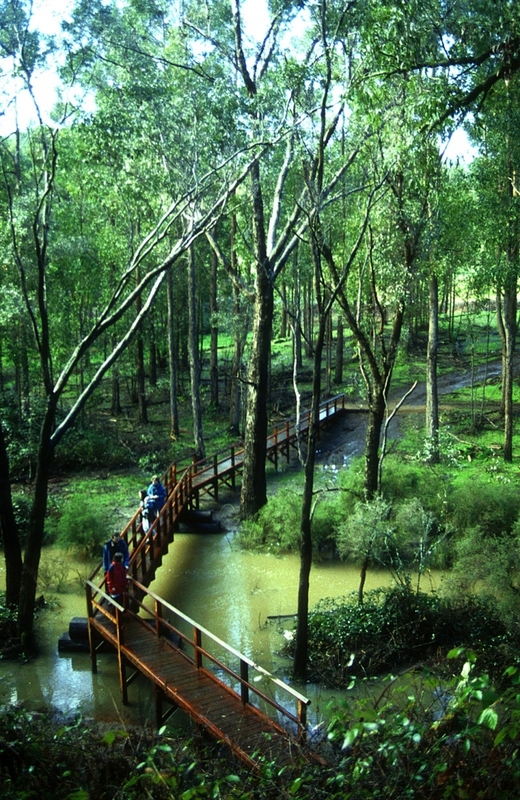 Just south of Balingup is the Golden Valley Tree Park, developed from an old farm by the local community and the then Department of Conservation and Land Management (now the Parks and Wildlife Service). Original groves of elm, oak, poplars and fruit trees have been enhanced with more recent plantings of a remarkable variety of Australian and exotic trees. The road leading out of the Park is the Old Padbury Road and is paved with the original cobblestones, laid by convicts many years earlier. The park contains hundreds of trees, is graced with several picnic spots and is an ideal place to spend time exploring. For thousands of years, the Nyoongar Bibbulmun people lived in and passed through this area. They used many local plants for food and drink, tools, shelter and medicine. These plants still grow along the banks of southwest’s longest river, the Blackwood. Five species of eucalypt unique to WA also grow adjacent to the Blackwood. Flowering at different times, these trees provide a year-round source of food for many nectar and seed eating birds and small mammals. They are the flooded gum, jarrah, yarri (blackbutt), marri and bullich. The abundant natural forest resources of the area were used by the early settlers who developed railway 'sleeper cutter' and 'hide' industries in the 1870’s. The valley was covered in extensive stands of jarrah, marri and yarri and was home to thousands of possums and water rats, valued for their pelts. Beyond the Tree Park, the Track is shared for several kilometres with a second walk trail, the Greenbushes Loop. This circuit walk leading to the old town of Greenbushes and back on the Bibbulmun Track, makes for an interesting day walk from Balingup. 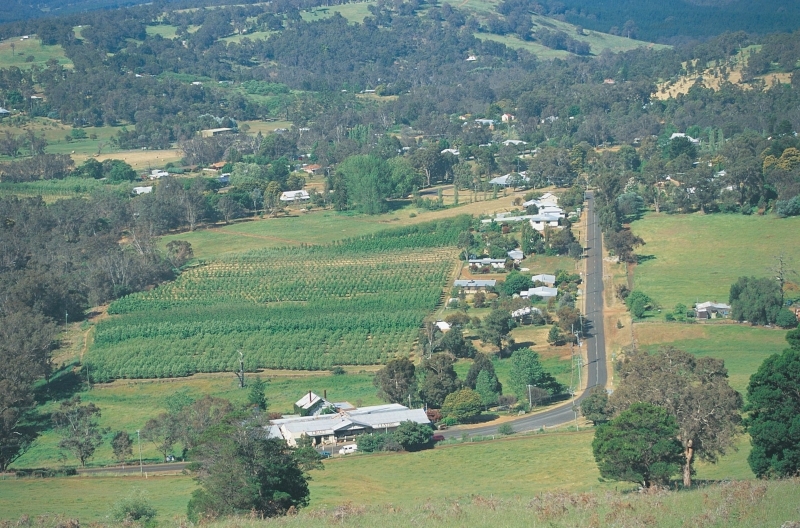 Greenbushes was founded as a mining town in 1888 following a surveyor's discovery of tin, and was named after the bright green bushes that contrasted against the grey eucalyptus trees. The mine is still active and now is a major source of the metal tantalum. A viewing platform overlooking the open cut mine is well worth a visit. Mist over the Blackwood Valley. The Track then climbs to the rim of the Blackwood Valley, and offers some spectacular views of the forests, plantations and picturesque farmlands of the valley, which dominate the walk south to the river crossing at Southampton Bridge. Beyond Blackwood the jarrah forest continues until it makes way for the first sight of karri trees at Karri Gully on the Brockman Highway between Bridgetown and Nannup. After crossing the Brockman Highway, the old Willow Bridge rail formation provides a very pleasant route along the Bibbulmun Track through the heart of the forest. There is a distinctive north to south transition from jarrah, through yarri, to karri. These tree species are found only in WA. Growing to 90m, karri is the third tallest tree in the world. Its smooth bark is shed in early autumn, leaving multi-coloured streaks varying in shade across the seasons from pink and orange through to grey and white. Just north of Donnelly River Village, a massive karri was specially cut in 1958 and sent up to Perth to be displayed at Kings Park. Unfortunately it is no longer a feature of the park. Emus, kangaroos and other wildlife is abundant at Donnelly River Holiday Village. Timber railways, such as the one heading south from the old Willow Springs mill site, once criss-crossed the forest. They frequently follow watercourses and their gentle gradients make ideal walk trails. The whistle of steam locomotives, thwacking of axes and whining of saws are now a dim echo. Kangaroos and emus parade the mill town streets and the forest rings once more with birdsong. 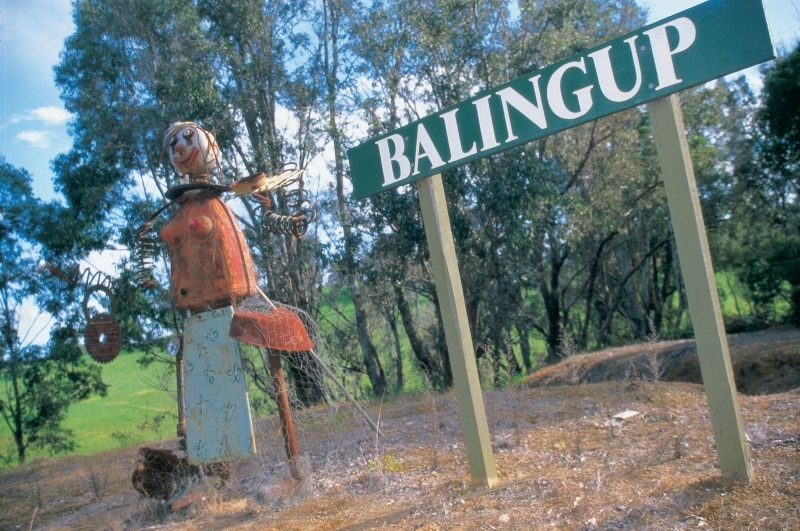 For more information on walking from Balingup to Donnelly River Village go to the Section by Section Guide.